A hereditary condition characterized by a variable lack of pigment in the eyes, skin, or hair. People with albinism may have pale pink skin and blond to white hair, but there are different types of albinism, and the amount of pigment varies. The irises of their eyes may be white or pinkish. They are sensitive to bright light and glare and commonly have other vision problems. While some people with albinism can see well enough to drive, many have impaired vision or may even be legally blind. Tinted eyeglasses, bifocals, magnifiers, and other optical devices can help people with this condition. Albinism is often accompanied by nystagmus or strabismus. People with albinism are sensitive to bright light and glare and may wear tinted eyeglasses. Bifocals, magnifiers, and other optical devices can help people with albinism. A condition in which a person's vision does not develop properly in early childhood because the eye and the brain are not working together correctly. Amblyopia, which usually affects only one eye, is also known as "lazy eye." A person with amblyopia experiences blurred vision in the affected eye. However, children often do not complain of blurred vision in the amblyopic eye because this seems normal to them. Early treatment is advisable, because if left untreated, this condition may lead to permanent vision problems or even partial blindness. Treatment options include vision therapy exercises, prescription eyeglasses, or surgery. People with amblyopia may need to wear an eye patch over their stronger eye in order to force the affected eye to function as it should. Rare condition in which one or both eyes do not form during pregnancy. When both eyes are affected, blindness results. There is no cure for anopthalmia. Prosthetic eyes can promote proper growth of the eye sockets and development of facial bones and also serve cosmetic purposes. Visual impairment caused by damage to the part of the brain related to vision. Although the eye is normal, the brain cannot properly process the information it receives. The degree of vision loss may be mild or severe and can vary greatly, even from day to day. Cortical visual impairment may be temporary or permanent. People with cortical visual impairment have difficulty using what their eye sees. For example, they may have trouble recognizing faces, interpreting drawings, perceiving depth, or distinguishing between background and foreground. Children with cortical visual impairment are often able to see better when told in advance what to look for. Cortical visual impairment is also known as neurological visual impairment (NVI). Persistent dryness of the eyes resulting from too little production of tears or too rapid evaporation of tears. People with dry eye syndrome may experience such symptoms as itching, burning, or stinging eyes. Some people feel as though something is caught in their eye, causing an irritation. Dry eye syndrome has many causes. For example, it may be linked to wearing contact lenses for long periods of time or to living in a dry or dusty climate. It may be a side effect of medication or a symptom of certain diseases. An eye doctor may recommend the application of special eye drops—"artificial tears"—to moisten the eyes or the use of a humidifier to increase humidity in the air. Not rubbing the eyes and avoiding such irritants as tobacco smoke can also help persons with dry eye syndrome. There is also now medication to treat moderate to severe dry eye. Specks or strands that seem to float across the field of vision. Floaters and spots are actually shadows on the retina cast by tiny bits of gel or cells inside the clear fluid that fills the eye. Floaters and spots usually are normal and harmless. However, in some cases they may warn of serious conditions such as retinal detachment, diabetic retinopathy, or infection. Someone who experiences a sudden decline in vision accompanied by flashes and floaters or a sudden increase in the number of floaters should consult an ophthalmologist urgently. Floaters and spots generally do not require treatment. In those rare instances when they significantly impair vision, surgery may be an option. Disease in which the pressure of the fluid inside the eye is too high, resulting in a loss of peripheral vision. If the condition is not diagnosed and treated, the increased pressure can damage the optic nerve and eventually lead to total blindness. Vision lost as a result of such damage cannot be restored. A person who has glaucoma may not realize it at first, because the disease often progresses with no symptoms or warning signs. Early detection through regular eye examination and prompt treatment is essential to prevent vision loss. Daily medication (usually eye drops), surgery, or a combination of both enables most people to control their intraocular pressure and retain their vision. A level of visual impairment that has been defined by law to determine eligibility for benefits. It refers to central visual acuity of 20/200 or less in the better eye with the best possible correction, as measured on a Snellen vision chart, or a visual field of 20 degrees or less. Disease that causes dysfunction of the macula, the area in the middle of the retina that makes possible the sharp central vision needed for such everyday activities as reading, driving, and recognizing faces and colors. The condition is commonly known as age-related macular degeneration (ARMD) and is the leading cause of visual impairment among older people. However, there are also other types of macular degeneration, such as Stargardt's Disease and Best's Disease. Macular degeneration causes blurred, distorted, or dim vision or a blind spot in the center of the visual field. Peripheral vision is generally not affected. This condition is painless and may progress so gradually that the affected person at first notices little change. There is no cure for macular degeneration, but drug therapy, laser surgery, or other medical treatment may in some cases be able to slow the disease's progression or prevent further vision loss. People with macular degeneration can also benefit from the use of various devices for low vision, such as magnifiers, high-intensity lamps, and pocket-sized telescopes. Disorder of the connective tissue, affecting the heart and blood vessels, skeletal system, eyes, and other parts of the body. The condition is present at birth. Symptoms vary from person to person, ranging from mild to severe. People with Marfan syndrome are often nearsighted (see myopia), and about half have dislocation of one or both lenses of the eye. There is no cure for Marfan syndrome. Treatment depends on which body systems are affected. Early eye examinations can detect vision problems related to the disorder, which can usually be corrected with eyeglasses or contact lenses. Rare disorder, usually inherited, in which one or both eyes are abnormally small. The degree of visual impairment varies, from reduced vision to blindness. Extreme microphthalmia resembles some forms of anopthalmia. There is no treatment or cure for micropthalmia. In certain cases, artificial eyes can be used to promote proper growth of the eye sockets and to help with cosmetic appearance. Separation of the retina from the underlying supportive tissues. 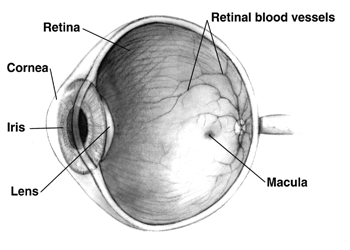 Retinal detachment may result from injury, disease, or other causes. This condition occurs most often in middle-aged and elderly people. A person with retinal detachment usually does not experience pain, but may see floaters (see floaters and spots) or bright flashes of light, may have blurred vision, or may see a shadow or curtain over part of the field of vision. Retinal detachment requires prompt medical attention to prevent permanent vision loss. There are several methods of treatment for retinal detachment, including laser surgery. Degeneration of the retina, resulting in decreased night vision, a gradual loss of peripheral vision, and in some cases, loss of central vision. The degeneration progresses over time and can lead to total blindness. Retinitis pigmentosa is a rare, inherited disease for which there is as yet no treatment or cure. Some opthalmologists believe that treatment with high doses of Vitamin A can slow the progression of retinitis pigmentosa, and that taking Vitamin E makes it worse. Early diagnosis enables a person with the disease to plan and prepare for its progression. In addition, depending on the degree of vision loss, electronic magnifiers, night-vision scopes, and other such special devices for impaired vision can provide some benefit for people with the disease. Malignant tumor (cancer) of the retina, generally affecting children under the age of 6. Usually hereditary, retinoblastoma may affect one or both eyes. Retinoblastoma has a cure rate of over 90 percent if treated early. Without prompt reatment, the cancer can spread to the eye socket, the brain, and elsewhere, and can cause death. Depending on the size and location of the tumor, treatment options include laser surgery, cryotherapy (a freezing treatment), radiation, and chemotherapy. In some cases, the affected eye may need to be removed.